Here’s an excerpt from the article about Christy and Derek’s stunningly beautiful wedding in Syon Park. This is a lovely article about this beautiful wedding. We really enjoyed playing for this wedding. Penny from Tigerlilly Weddings was the organiser and so everything both ran smoothly and was fabulous to look at. Syon Park is a great backdrop for the string quartet. Both in the ceremony and the reception, it works really well. The courtyard being walled on either side gives us the shade we require on a sunny day (the sun can damage the delicate string instruments), and also actually enhances the acoustic outdoors so the sound doesn’t just disappear as it can in very large open spaces. 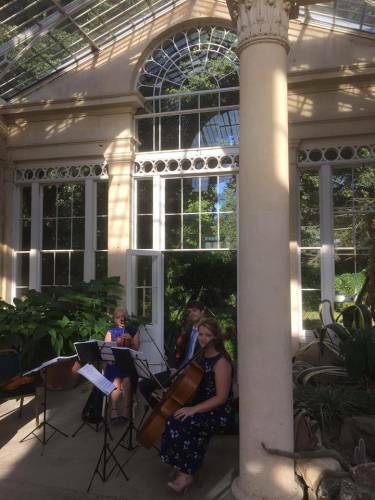 We’ve also played in the Garden Room in Syon Park, which works really well and also for small jazz bands. It’s an amazing wedding venue – very grand and celebratory!